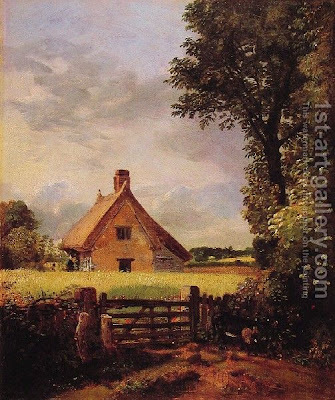 John Constable, "Cottage in a Cornfield"
My bike ride to school this morning was as serene and uplifting as yesterday’s. The air was clear and cool, and once again the early light seemed magical. I didn’t push it – just cruised along enjoying the bountiful feeling of freedom and good fortune. To quote an old Eagles song, I had a "peaceful, easy feeling" during my morning classes. I think it was due, in large part, to not rushing. I had planned a sensible amount of material to cover, and consequently I was able to move through it in an almost effortless way -- not dashing, like yesterday, but more like gliding or even sauntering. I felt the way I occasionally feel when I'm riding my bike in an especially natural and unproblematic way -- when riding seems as easy as breathing. It doesn't happen often in bicycling or teaching, but it happened to me this morning.